Except for the fact that she was my dad’s cousin, I wouldn’t have known who she was either. 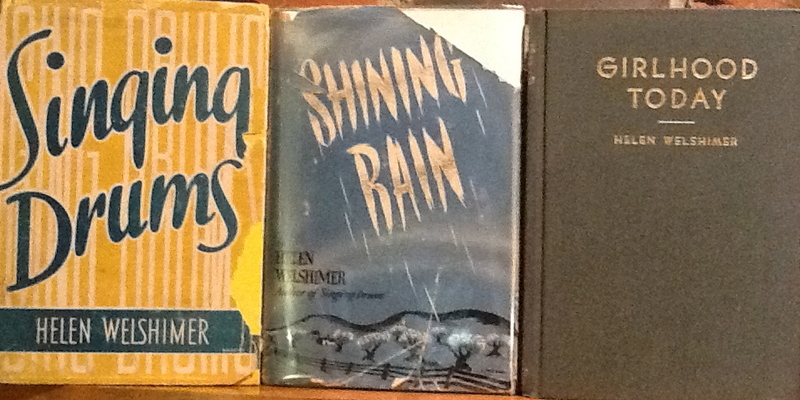 Ms. Welshimer was a poet and a journalist and an essayist during the 30’s, 40’s and 50’s. She wrote for a couple of newspapers in Ohio and eventually became a freelance writer with NEA (Newspaper Enterprise Association), where her interviews and articles were syndicated nationwide. She was a contributor to several magazines, including Good Housekeeping and published several books of poetry. She was accomplished to say the least but unfortunately I never got to meet her. Helen died in 1954 at the age of 53 and I was born a few years later. I’ve always wished that I had gotten to know her because she seemed so glamorous. She was beautiful and talented, a small town girl who left Canton, Ohio to live in New York City and also a bit of a mystery. Fourteen years before Helen died she came home to Canton and became bedridden, a semi-invalid that never recovered her health. I dare not speculate on what happened to Helen but it was a tragedy that someone so vibrant and young, spent so many years suffering. Helen continued to write but remained at home taken care of by her mother. My parents owned one of Helen’s books and I’ve recently acquired two others. 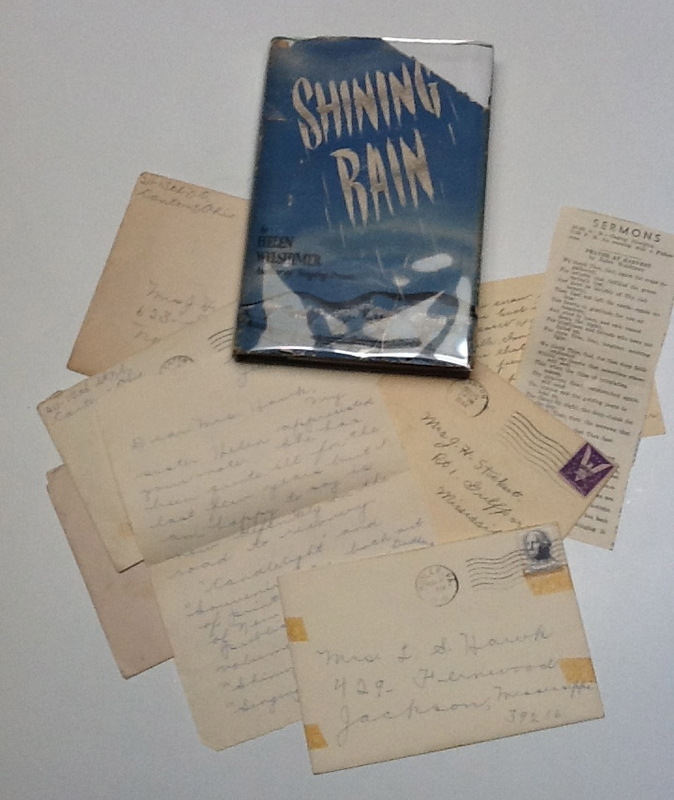 When I ordered Shining Rain off of the internet I was astounded when the book arrived and three letters and two Christmas cards fell out. 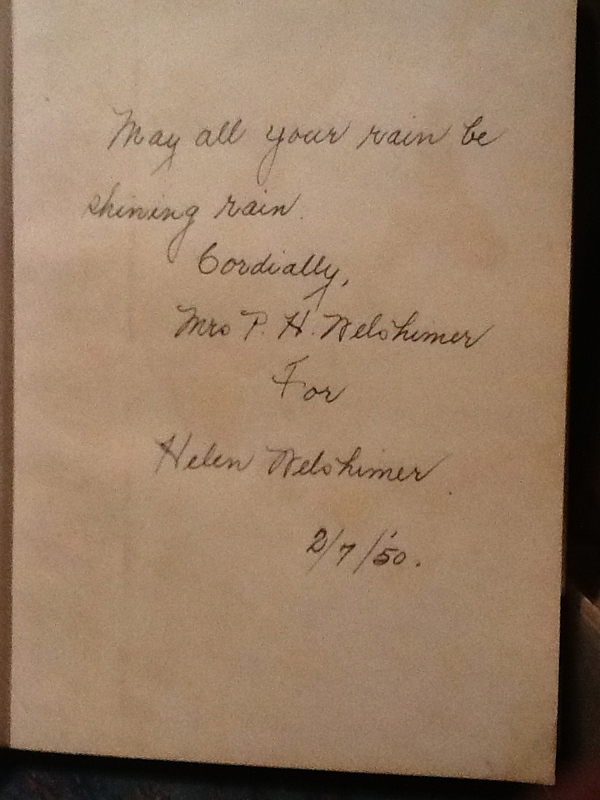 The original owner of the book of poems must have been a huge Helen Welshimer fan and it seems had written several fan letters to her home in Canton. Helen, her mother Clara and her sister Mildred, penned responses to the fan letters and the owner of this book stored her treasures amongst its pages. I am so happy that these letters, written by my family were preserved and that I was lucky enough to be the person that bought this particular copy! Serendipity!